Author and explorer James Michael Dorsey has spent two decades visiting the world's most remote tribal cultures. 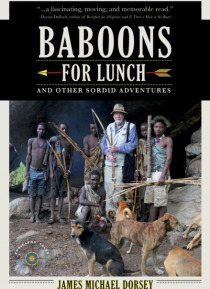 In BABOONS FOR LUNCH and Other Sordid Adventures, he tells his remarkable travel stories in rollicking accounts that keep readers off balance and eager for more. Many stories are funny, others are poignant, and quite a few are heart stopping, while others are unique insights into remo… te ways of life most of the world does not know exists. In this book the reader will climb a remote volcano in Ethiopia, cross the Sahara Desert with nomads, undergo a tribal exorcism, and visit shamans, healers, witch doctors, and holy men. This is not your average travel book, but an entree to some of the world's remote corners and people.